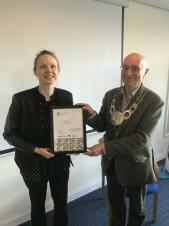 In April 2017 Dursley Town Council were awarded Local Council Award Scheme 'Quality Gold', the first Council in Stroud District and the second council in Gloucestershire to achieve this award. We have built on our previous Quality award obtained in September 2016. On Monday 10th April, we were visited by an assessment panel including Cllr Stephen Hirst (Tetbury Mayor & Chair of Gloucestershire Association of Parish & Town Council), Alison Robinson (CEO – GAPTC), Elizabeth Skinner (Society Local Council Clerks) and Julie Shirley (Eastington Parish Council – Clerk). The independent panel conducted a visit (the final stage in the award process), which included an interview with the councillors, and a tour of the area, visiting the War Memorial Recreation Ground, Highfields Play Area and The Vibe Youth Centre. Alison Robinson said "The Local Council Award Scheme promotes quality practice in local councils. The scheme has three levels, 'Foundation' (minimum standards), 'Quality' (Good practice) and 'Quality Gold (Best practice). Dursley Town Council has worked to submit their 'Gold' application, which demonstrates a clear commitment to the Dursley community that they provide a quality service and quality vision for local people". One panel member described the Town Council as 'the perfect example of what a Gold quality council should be. Mayor Grecian was presented the "Quality Gold" award from Alison Robinson, Chief Executive of the Gloucestershire Association of Parish & Town Councils at the Town Council's Annual meeting on the 9th May 2017.